Guest Blog by Bruce Krentz from Thompson, Manitoba. Get Cold…It will make you feel better! 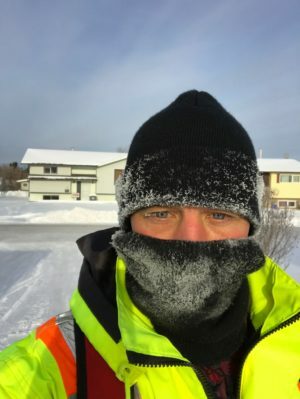 I live in Thompson, Manitoba, where there is snow on the ground at least 6 months of the year. It’s winter a lot and that’s cool with me (pun intended). I keep winter from being dark and dreary, literally and figuratively, by getting cold sometimes… and I think you should too. When I say cold, I don’t mean frostbitten or hypothermic! What I mean is below zero and sometimes mildly uncomfortable, but dressed for it and safe. I can see that from the outside I am a bit of a stereotype for someone who would make a post like this… I am a 48-year-old man, with a family, a good job and a mini-van. We are a one-vehicle family, we compost and recycle, I listen to public radio and eat mostly vegetarian. I have always been active, but for the last 10 years, I have really embraced Active Transportation. I walk and cycle to work exclusively and many other times of the day too. I could drive around if I really wanted, so this is a choice, not a necessity. I understand that I represent a small, somewhat privileged piece of society, but we all have feelings, and to me, this is a pretty easy way for anyone to feel good – so, get out and get cold. Top 5 reasons why I get cold on purpose. For the first time in history, we live in a mostly climate controlled environment. Everywhere we go is 73 degrees…our heated house, air-conditioned car, glass-walled office… you see where I am going with this. We lose some of the good feelings that come with different temperatures at different times of the day… coming into a warm house after a winter walk…A breeze blowing in a window on a hot day…sleeping in a cold room under a big blanket. Somehow we are starting to fear temperature changes; I think there are more good than bad feelings that come with different temperatures at different times of the day. There is joy in being outside from +30 to -30. If you eat the same thing for lunch everyday…maybe stay inside. I’m an explorer but risk-averse. I look forward to going toe to toe with Mother Nature; braving some nasty weather. I feel like I have pushed myself and accomplished something that the SUV’ers are too soft to do. 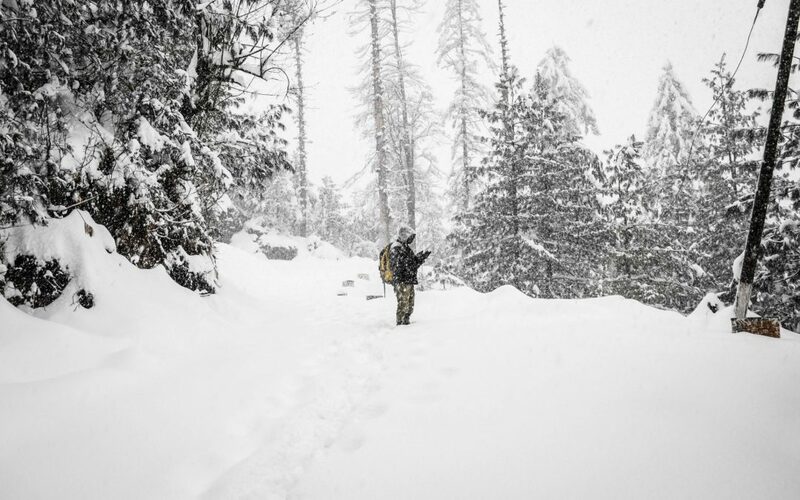 But, instead of bivouacking and eating freeze-dried rations, I still sleep on a pillow top bed, eat fresh veggies, and I’m never more than 5 minutes from a safe haven. I am an outdoor adventurer and never in real danger. I listen to podcasts when I am on the move. I do double duty, getting to work and learning something or listening to an interesting story at the same time. If you are curious… My list is heavily documentary, public radio sort of stuff (Stereotypical… I know) but there are some outliers in there too (can you say Snow Day Podcast)…e-mail me and I’ll happily share my list. I get off my A**. I sit in a temperature controlled office too much. Fresh air and a little vitamin D from real sunlight balance out the artificial light and help chase away SAD…all a pleasant 180-degree change from the cubicle farm. White is different than green. A town looks and acts differently in winter than summer…being part of the sights, sounds, and smells of my City puts a smile on my slightly weathered face. In my humble opinion, all those are best experienced at a human pace. Try getting cold, you might see there are very few really “bad” weather days and winter doesn’t feel so cold and dark…literally and figuratively. Dress in layers… don’t worry about expensive special clothes…you are Canadian you have warm clothes…check your phone for temperatures and put on more layers if it is cold. You need fewer clothes than you think; moving makes you warm (Thanks Captain Obvious). You already know how. Walking is still just one foot in front of the other…biking is still just pushing the pedals (although maybe a little less leaning into the corners). It’s the same as every other time of year. 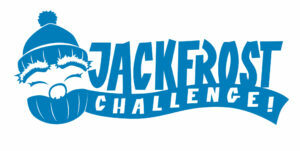 If you’re looking for a chance to get cold, intentionally, register for the eighth annual Jack Frost Challenge, taking place February 3-9, 2019! Want to hear more from Bruce?